Deb's Cup of Tea: How Do You Like Your Car? I have been asked this alot lately. It's been six months since the Jeep was replaced. I've gone through every season except spring, but, given the warm air over Chicagoland, you could say we had mini-spring this past week. 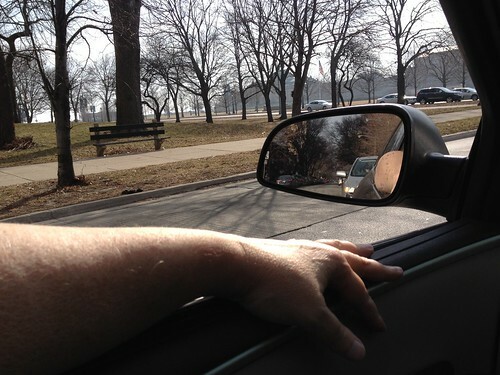 I'm driving around Chicagoland on Monday, February 20th, with the windows down and wearing a short sleeved shirt. My photo feed reminds me that 3 years ago, we had 6 inches of snow. There are things I miss about the Jeep. It was fun to drive, even in traffic, with the stick shift. It sat up higher and I felt I could see more of what was around me. I'm constantly tweaking the mirrors because I don't feel I can see to my left or right, even when I turn to look before changing lanes. Never had that issue with the Jeep. 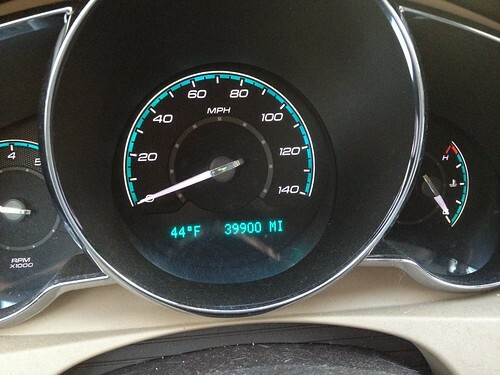 There is one thing the Malibu has which the Jeep did not. I have information at my finger tips. This was in August. We didn't get a lot of 100+ degree days. We haven't had a summer that hot in a few years. I'm not complaining, mind you. I like hot weather but I think I would feel extremely oppressed if that was the norm, rather than the exception. 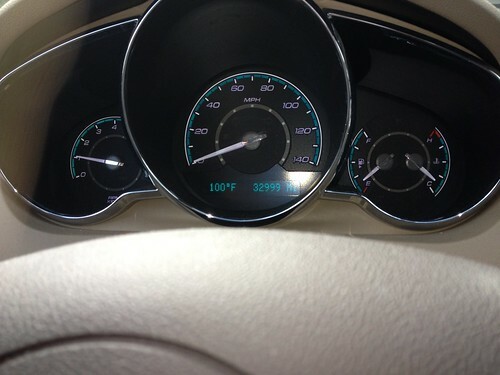 On the Monday the above photo was taken, this was the temperature when I got into the car. I documented this more for the "Oh look. An even number of miles", than the temperature. I haven't figured out the trip meter. I'm going to have to actually read the owner's manual for that. Until I do that, I write the beginning and ending mileage in the notebook I carry with me. The Jeep had a little button I pushed to reset the trip meter. I also have a tire pressure and oil life indicator I can scroll through. I don't like the lack of a beep or a light if the gas gauge gets low. I have to notice and then set the display for "Fuel Distance". I've come close to being out of gas because I don't have that on the display. (Note to self: you need gas.) Perhaps a noise can be set but I'll have to read the manual to figure out how. I used the Sirius XM radio free three-month trial and I am NOT signing up for that service. If I listened to classic rock, hip hop, rap, or current popular music, it would pay to have it. The sheer abundance of stations playing that kind of music was immense. I listen to jazz. I had the 1940's channel; the all Frank Sinatra channel; the 'smooth jazz' channel; and a channel devoted to Broadway musicals. Huh? No thanks. When I go cross-country and are out of the reach of my local jazz station, I have a CD player. I can listen to Gregory Porter's "Be Good" or Annie Lennox's "Nostalgia" or Duke Ellington's "Three Suites" or "Ella and Louis Together" or any of my jazz albums, provided I remember to bring my CD case. And don't even get me started on my Scottish music. A station for that? You're nuts. They have been calling to get me to renew my subscription but don't seem to get that what they offer is not what I like. Last night, I told the guy, "Please stop calling. I won't sign up and the more you call, the more angry I am and the less likely I'll consider your service, period." "But...but...ma'am, you just need to listen..." Click. As I travel about for work, I've found a number of people who say the Malibu is probably the best passenger car Chevrolet makes. They are impressed I drive one, even one which is 6 years old. How do I like my car? For once, in spite of the circumstances surrounding the purchase, I got a break from life. I'm happy. It works for me.